Popular online finance service Mint launched a new feature on Thursday that uses Twitter’s real-time information stream to keep you up-to-date on the latest financial news and tips. Called Money Tweets, Mint’s newest addition is a great example of how businesses and services can exploit Twitter as a source for topical links to important news stories and helpful information. Money Tweets embraces the functionality of Twitter Lists and Twitter search to bring you posts from trusted news sources, tips from popular money management gurus and the hottest money-related discussions happening online. 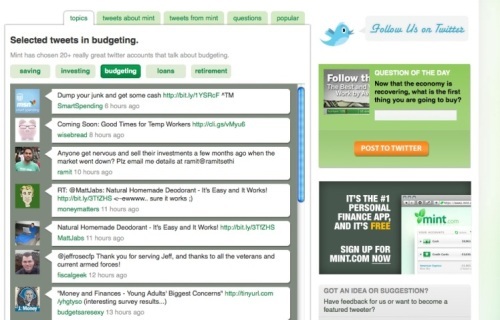 Money Tweets breaks down the information into five categories: personal finance topics, tweets about Mint, tweets from Mint, Mint’s Question of the Day, and popular discussions. Mint has gathered more than twenty popular finance-related Twitter accounts to keep you informed about the latest news and tips to help keep your finances on track. 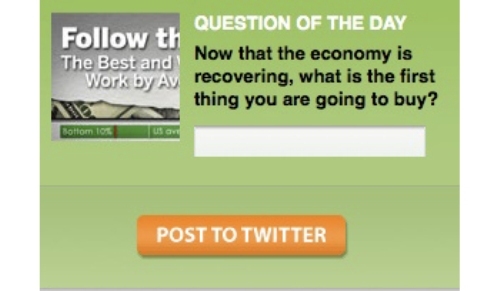 Topical tweets are broken down into five money-related categories: saving, investing, budgeting, loans, and retirement. Selected Twitter accounts include those from popular finance sites, personalities, and news outlets like CNBC, the Financial Times, The Motley Fool, SmartMoney, TopStocksMSN, The Wall Street Journal, StockTwits, and personal finance columnist and author Liz Pulliam Weston. One of the more interesting sections in Money Tweets is the Popular section, which tracks the hottest financial news on Twitter in real time. 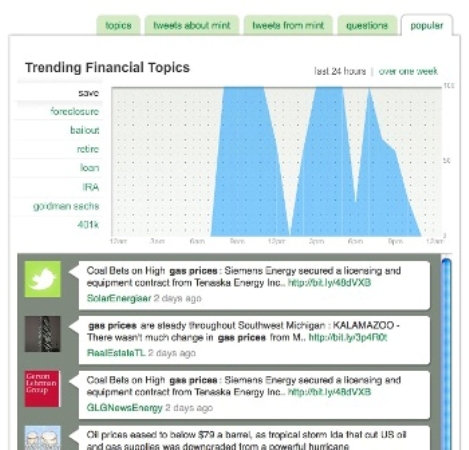 At the top of the page is a graph that shows trending patterns for popular money-related topics over the past 24 hours or the past week. Underneath the graph are the latest tweets relating to that subject. But this feature still has some bugs to work out. In my tests, the popular section had trouble switching between topical tweets. Clicking on the Goldman Sachs topic gave me appropriate posts related to that subject, but when I tried switching away to another topic the list of tweets didn’t change. You will also end up with the occasional misplaced tweet. When I was looking at tweets related to the government bailout, a post related to Motorola’s new Droid smartphone popped up. But this feature still has some bugs to work out. In my tests, the popular section had trouble switching between topical tweets. Clicking on the Goldman Sachs topic gave me appropriate posts related to that subject, but when I tried switching away to another topic the list of tweets didn’t change.